It was late Thursday night. Jesus was in the Garden of Gethsemane with his disciples. He was deeply grieved to the point of death, praying to His Father and sweating drops of blood as the weight of the sin of the whole world was pressing upon Him. He knew the arresting soldiers were on their way. To add to His agony, His disciples were asleep. all except Judas. Judas Iscariot was busily leading the charge against Him. Judas was a thief and a lover of money (John 12:6). He sold Jesus out for a mere thirty pieces of silver, the price of a slave. Stop and think about that: Judas sold out the holy, eternal, unfathomable God for the price of a lowly slave. How tragically amazing! The Bible tells us that it was at the Last Supper, after Jesus had washed the disciples' feet (Judas included) and instituted the Lord's Supper (the new covenant in His blood), that Satan entered Judas. How boldly arrogant and offensive for Satan to enter Judas right in the Lord's physical presence! With Satan firmly in charge of him, Judas, a picture of the antichrist to come, went to lead the soldiers to Gethsemane. He betrays Jesus with, of all things, a kiss. Isn't that just like the devil? It is not enough to merely stab Jesus in the back with betrayal. he has to twist the knife in the process. Betrayed with a kiss. a kiss from hell. Can you identify with Jesus? Have you ever been betrayed? Have you ever had someone "kiss you" with deceitful kindness so that they could gut you down the road? Many a wife or husband has experienced the kisses of a "best friend" who subversively steals away the marriage. Many a friend has experienced the kisses of a "trusted" confidant who goes out and betrays that confidence to the gossipers. Many a leader has experienced the kisses of so-called supporters who delightfully malign his character behind the scenes. Can I get an "Amen!" somebody? What are we to do when we receive the kisses of betrayal from a trusted friend? Get angry. resentful. and bitter? Curse God and die? NO!! We are to do what Jesus did and pray, "Father, forgive them; for they do not know what they are doing." It is amazing how potential bitterness will evaporate in your heart when you pray for the well-being and blessing of those who have hurt you. What are we to do when we are the betrayer? We are NOT to do what Judas did. When he saw that Jesus was condemned to die, he was overcome with grief and remorse. But instead of repenting before God, He returned the thirty pieces of silver and went out and hanged himself. As Dr. Adrian Rogers has so poignantly explained, "Trying to escape the hell within him, he stepped into the hell before him." What a tragic picture of wasted privileges and opportunities was this Judas Iscariot. When you are guilty of betrayal, you must get things right with God and the person you betrayed. Peter was guilty of betrayal. In the Lord's great time of need, Peter cursed and swore and said, "I don't even know the man!" And what did Peter do? He went out and wept bitterly. and repented of his sin and received forgiveness from God. You can do the same! The lessons of Good Friday and Easter Sunday are numerous. The overarching message is clear, however: No matter what terrible things you may have done, your sins can be forgiven in His name. No matter how long you may have lived in sin and selfishness, no matter how low you may have sunk, no matter what hurt you may have endured, you can receive a fresh start and a new beginning from the King of Glory! The Lord really does love you, my friend. He allowed Himself to be betrayed (He knew what Judas was doing every step of the way) and willingly went to the cross so He could pay for all your sins and mine. He wants to have a relationship with you that is real. and personal. and life-changing. It starts when you confess your sins and turn from those sins to Jesus. Will you do it? Will you get things right with God and those you have hurt? Will you let go of the bitterness you may be carrying over those who have betrayed you? There is nothing as wonderful as knowing your heart is clean, pure and free because of the blood of Jesus. And that can be yours today! Easter is when we celebrate the death and resurrection of Jesus. What does that mean for us? 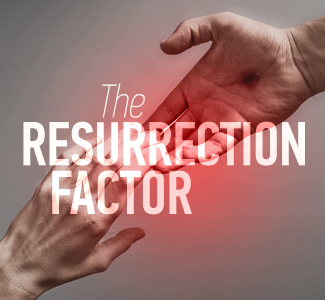 In this message from Pastor Jeff Schreve entitled, The Resurrection Factor, you will be reminded of the precious sacrifice our Savior made and how He is at work in your life today! Click here to find out more!